The 9th Battalion Blue Ridge Grays is an American Civil War living-history re-enactment organization, and is one of the twelve battalions that comprise the 1st Division, Army of Northern Virginia, headquartered in Richmond VA. The battalion is comprised of Confederate units from the northeastern United States and Canada, with units located in New York, Vermont, Ontario, and Quebec. We organize and attend events throughout the region, as well as one or more national events each year. The Blue Ridge Grays is organized as an early-to-mid war legion, containing infantry, cavalry and artillery companies, as well as signal and other support units. The battalion is a family-oriented reenacting group with a strong civilian organization, represented by the Blue Ridge Grays Soldier Aid Society, that serves as an important component in the activities of our organization. 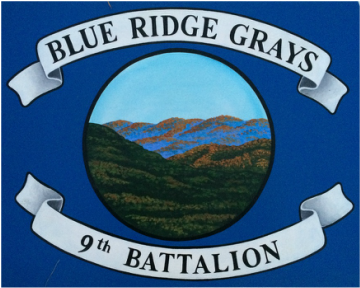 Any Confederate reenacting unit within our area of operations is welcome to become a part of the 9th Battalion Blue Ridge Grays.